15 (18, 21, 24, 27)" chest circumference, buttoned; to fit a 3 month (6 month, 1 year, 2 year, 4 year) old. 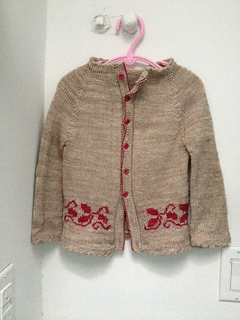 Cardigan shown measures 24". -Finished Size 15 (18, 21, 24, 27)“ chest circumference, buttoned; to fit a 3 month (6 month, 1 year, 2 year, 4 year) old. Cardigan shown measures 24”. -Yarn Bergère de France Perfection (65% superwash wool, 35% polyamide; 137 yd 125 m/1¾ oz 50 g): #29017 noisette (tan; MC), 2 (3, 4, 4, 6) balls; #25413 eau vive (blue; CC), 1 ball. -Needles Size 3 (3.25 mm): 16” and 24” circular (cir) and set of double-pointed (dpn). Adjust needle size if necessary to obtain the correct gauge. -Notions Markers (m); stitch holders; tapestry needle; 5 (6, 7, 8, 10) 3/8” buttons. -Gauge 26 sts and 35 rnds = 4” in St st.
Unisex baby sweater is knit in one piece from the top down and steeked. Hemmed edges give a professional finish.